Market segmentation consists of splitting a group of customers belonging to a mass market into smaller groups of customers with similar purchasing needs and behaviours. By doing this, you can establish target markets, and then customize your services and products to meet their preferences. Market segmenting has become common practice amongst marketers and businesses who want to understand consumers buying behaviours for a service or product. While it sounds easy enough to do in theory, many companies have had problems when performing their segmentation – you can easily get caught up in the detail. We briefly covered the simple definition for marketing segmentation and the key areas, so now let’s look at the purpose it has in your marketing activity. Simply put, market segmentation is an excellent way to gain as much knowledge as possible about your product’s consumers, and then use that information to create highly targeted marketing campaigns for them. Target marketing a certain group doesn’t mean excluding people who don’t pertain to the criteria you’re working with, but rather using it as an effective method of learning as much as possible about them so you can create bespoke marketing campaigns to suit. This is an incredibly affordable and effective way to reach potential clients and generate revenue. The first step in segmentation is to spot variables using demographics, and geographical and financial information. Not that long ago, doing this would have been sufficient to complete your segmentation activity, but nowadays there’s no direct way to link a person’s demography or geography to their buying patterns. Experienced marketers know that different customers buy for different reasons, and engage with products and services in different ways. In this stage, marketers should use customised market research methods to find out more about their target audience. Aspects to keep a look out for are your audience’s purchase situations; customer purchasing environments; and understanding local conditions that could impact purchase decisions. Segmentation also identifies variables through behaviours, psychographics (i.e., real people’s lifestyles, attitudes, and self-imaging), and culture. Most of these variables require marketers to examine the customer market through primary research methods like surveys, or by hiring consultants to research information about them for you. In short, you’re going to need data. Deep segmentation allows for competitive gains over rival companies whose segmentation may not be as substantial as your efforts. To access such information, marketers have to use a surprising amount of resources and time in order to collect customer data. Segments should then be sorted according to “tangible” marketing strategy characteristics: Identifiable, substantial, accessible, stable, differentiable and actionable. 1) Identifiable traits allow you to find and measure customers’ characteristics, like demographics or product usage behaviour. 2) Substantial traits deal with large segments that can be potentially profitable. 3) Accessible characteristics should be reached via communication and distribution channels. 4) Stable segments can be strategically marketed over a long period of time. 5) Differentiable targets in a segment should have similar needs that are clearly differentiated from the needs of people in other segments. 6) Actionable characteristics define the ability to provide products or services to your segments. When segmenting your market, you also want to ensure you’re asking yourself if you have targeted all the potential customers that fit into the segment; whether you fully understand your targets; whether your target will benefit from your products and services; whether your customers can afford them; and if your idea, product, service is easily accessible to your customers. 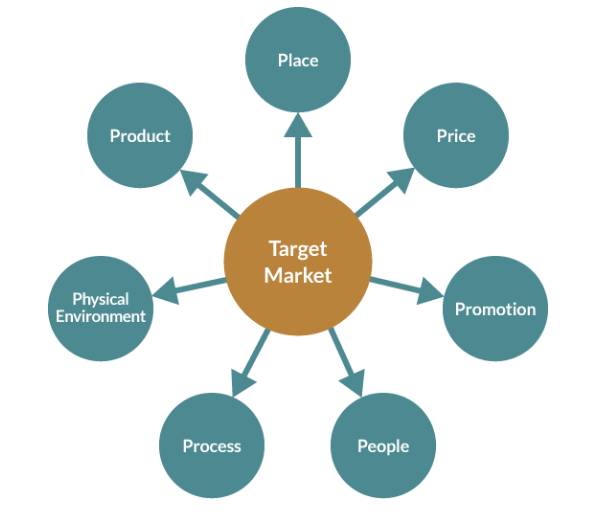 Devoting time and resources to looking for target markets can help you maximize your marketing strategy. With a clearly defined target audience, it is much easier to determine where and how to market your company. To build a good targeting strategy, you have to start by acknowledging that there isn’t a single strategy to suit all of your audience, so it’s important to brainstorm custom strategies for each target market. Next, you must perform a cost-benefit analysis between all available strategies before selecting a particular targeting approach to find out which best suits your business. Mass Targeting: Using this method, marketing teams view their markets as one group using a single marketing strategy. Niche Targeting: This approach combines mass and segmentation marketing by focusing on a particular market niche on which marketing efforts are then targeted. This method is mostly used by small firms which have identified a smaller sub-section of a larger segment that is not served by larger firms. Multi-Segment Targeting: This strategy is used by marketers to target multiple markets using a distinctive marketing strategy for each. Multi-segment targeting mainly offers benefits to large consumer product firms that offer multiple products within a wider product category (like a company that offers socks under a footwear category, for example). Micro-Marketing: Micro-marketing targets customers with individualized marketing programs. For micro-marketing segmentation to be effective, marketers must allow customers to create their unique products. This targeting method has flourished with more and more companies using the internet to conduct their business. Positioning is the process by which you market a brand, product or service and then communicate the benefits to potential customers, with the goal of convincing them that your product or service is better than those of your competitors. Positioning successfully involves you having expansive knowledge of the key benefits sought after by the market, and knowing what your customers truly want to buy from you, as well as how your product stands out among those of your competitors and what makes your products stand out amongst them. Once you have a clear view of these strategic aspects, you can then develop a positioning strategy for your business plan that will include a description of the target market, the product that is being bought, who the competitors are, and what your unique selling proposition is. After doing this, you will then know the benefits wanted by the market, and therefore the overall market strategy can be evaluated for each target market easily. As customers’ personalities, needs, and behaviours change over time, it is essential that companies keep up the pace and constantly revise their segments with new data to reflect these behaviours. You will want information about which benefits and features matter to customers, and data on emerging social, economic and technological trends that may alter purchasing and usage patterns. Effective segmentations need to be dynamic in two ways, and need to be redrawn as soon as they lose their relevance. The first way to do this is to concentrate on the needs and behaviours which are rapidly evolving, rather than personality traits, which normally persist through a person’s life. The second way is to understand that segments rapidly reshaped by technology, fluctuating economics, and new consumer niches. If a company, business or firm ignores market segmentation and ignores their target customer, there is nothing to sell and nobody to sell to. A good market strategy and thus a good segmentation plan can increase your competitiveness, brand recall, customer retention, communications and expand your market. Target the proper segment and you will walk away with a better company and higher profitability. Once you have defined your segmentation strategy you can focus on segmenting your customer and prospect data in alignment. This will make your sales funnel and lead nurturing process much more efficient and effective.